Fa Fa Twins by Betsoft ✅ Play on iPad & iPhone: Take a Free Slots Spin. This is an entertaining and unique iPad compatible slot game from Betsoft. The slot introduces you to two twin sisters who will use their charm and magical powers to help you win. 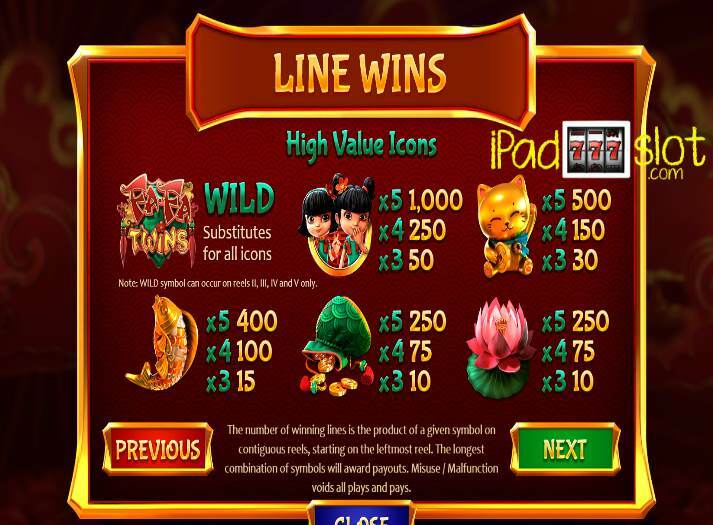 This Asian themed slot comes with 5 reels and 243 ways to win. This slot has a 96.90 Return to Player percentage on our reviewed game but other versions may be a little higher or lower at popular iPad casinos. The background of the game is covered in a solid red colour which is a colour representing luck and happiness in the Far East. Standing on either side of the reels are the two twin sisters with a banner just above their heads indicating the number of paylines this slot game has. On the reels are the symbols all resembling features common in Japan. These include a pouch of gold coins, golden cat, golden fish, fa-fa twins’ symbol, bear, red lantern, and cherry blossom. The slot also comes with traditional poker symbols i.e. Aces, Jack, Queen, and King. Fa-Fa twins: The highest paying symbol of the game is the icon with the two cute sisters. Matching 5 of these symbols rewards you with 5,000 coins. Bear: This symbol is the second most paying rewarding you with 2,500 coins when you match 3 or more on the reels. Golden cat: The cat symbol is the third most paying symbol rewarding you with 2,000 coins for a winning combination of 3 or more. Cherry blossom and a pouch of gold coins: Following in fourth place are these two symbols which reward you with 1,250 coins when you match 3 or more of the same kind. Poker symbols: The traditional poker symbols are the least paying symbols of the game all carrying the same payout value. Wild: The wild symbol is represented by the game logo which can substitute for any other symbol in completing a winning combination. The wild only appears on reel 2, 3, 4, and 5. Scatter: This slot does not have a scatter symbol. 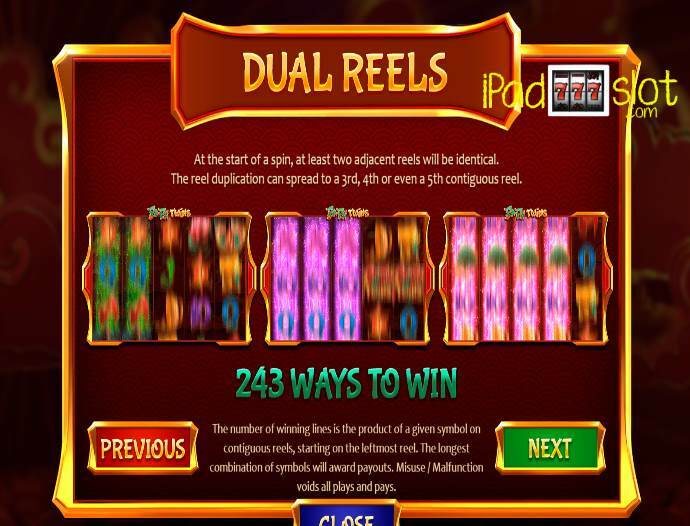 Dual reels feature: The uniqueness of this slot game is demonstrated by the dual reels feature. This feature allows 2 adjacent random reels with the same symbols to land anywhere giving you a higher probability of matching 3 or more symbols. 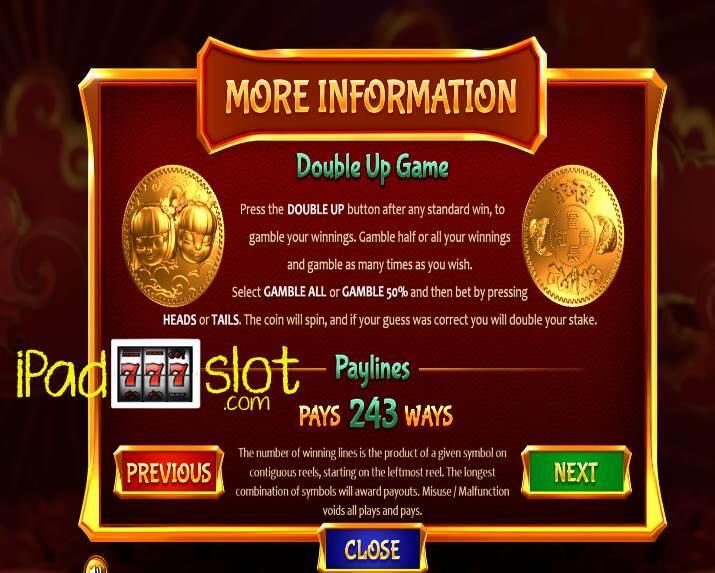 Double up game: You have the option to double up your win after every win by playing the double up game. In this game, you can either bet with half or all of your win. The aim is to gamble the side of the coin when its tossed. A correct guess double up the win while a wrong guess will see you forfeit your bet/win. This is a good game for someone looking to try something new and unique due to the exciting dual reels feature. 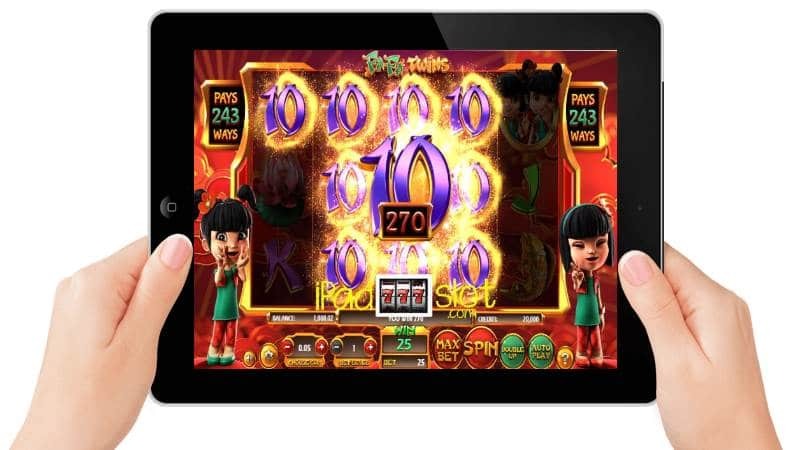 It gets a rating of 7.5 out of 10 points so it’s overall a nice Asian genre slot game to play for free or real money from our iPad casino reviews.